OpenLink Virtuoso has the capability to act as a host for PHP applications. Where you're currently used to seeing a LAMP (Linux, Apache, MySQL?, PHP) stack, Virtuoso can do the job of both Apache as web-server and MySQL? as database - and lots more. Virtuoso brings a myriad of extra features, from not just a fast relational database store (although it does that too), to RDF triple-store (actually a quad-store; each triple is associated with a graph), to semantic-web engine to application-development platform and beyond. Existing applications such as PHPBB and WordPress? are large pools of personal and social data - a "data space" - yet the means of querying them are mostly limited to the domain and application themselves. 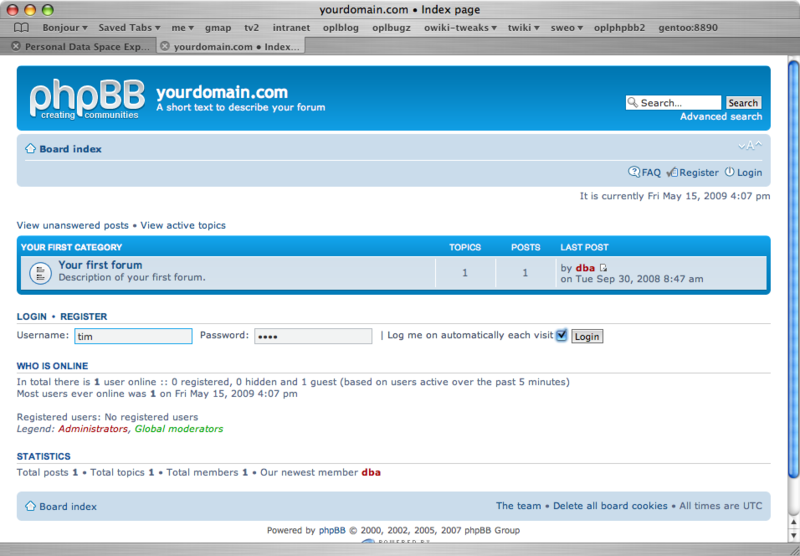 For example, within a phpBB3 instance, you can type a word into the search box, but the results are constrained to coming from only that instance, notably the format in which it chooses to display them and the actions it permits you to take based on the results, and (in this case) there is no URL with which to identify the query itself (so no bookmarks, no sharing with others). More advanced queries require digging around the underlying tables with SQL, if you have access to the backend DB. None of these methods allow one to execute a search on a WordPress? blog for "red, by which I mean the square in Moscow not the colour". As we shall see, semantic-web technologies will address this. The good news is that the underlying data is much richer, and may be exposed in such a way for users to deploy their own query-tools against it by opening it up in the form of RDF. RDF is a framework based on the Entity-Attribute-Value data-model; it can be thought of as a set of statements expressed in triples subject, predicate and object where the subject entity and predicate must be identified using URIs, and the value object may be either a URI or a literal value. As a separate consideration, RDF may be serialized in several formats; there is RDF/XML which is orientated towards machine-reading, but there are also Turtle and N-3 syntaxes more readily accessible to humans. We regard the representation as of secondary importance compared to the fact it is statements being represented in the form of triples. Entities, described by RDF, group into "graphs" - a set of nodes linked one to another by predicates. This is an improvement on Web-1.0 and 2.0, where all that could be said for a link is that one page links to another, optionally with some significance attached to the freeform keywords used for the link. With RDF, all links are precisely meaningful: you know what it means to be a foaf:nickName, as well as the fact that a particular entity has a given nickname, for example. Further, there is a language for querying RDF data, SPARQL, where the queries may be routed over HTTP as a transport (by the data-provider making a /sparql endpoint visible). 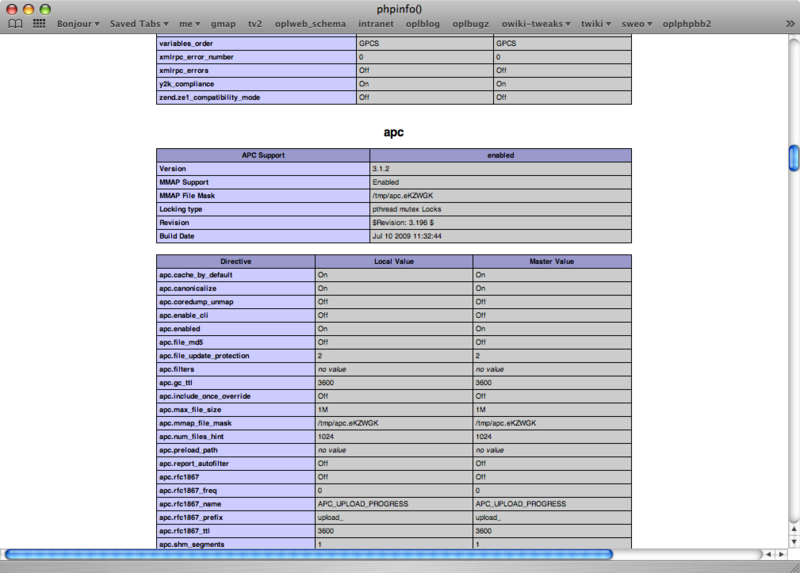 This gives every SPARQL query a fixed URL for later reference. 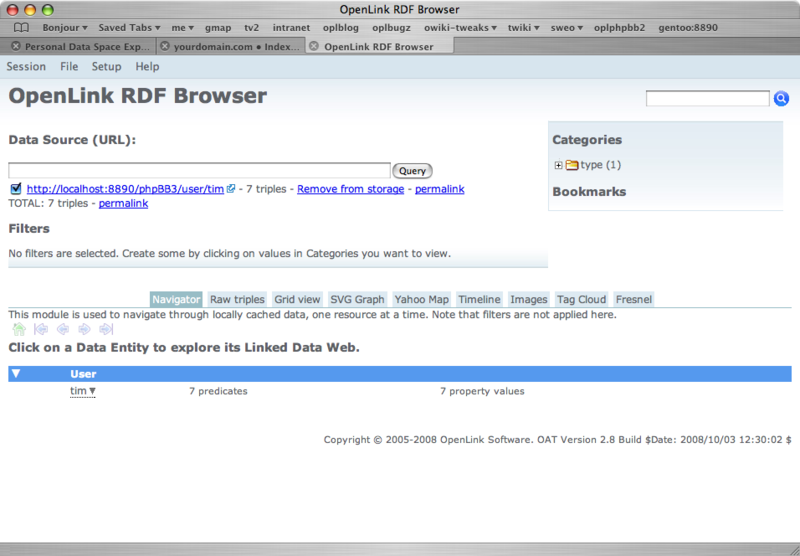 Querying extends to browsing, made possible with generic RDF-browser utilities such as OpenLink's ODE and Zitgist, or Tabulator, etc. A URL is the location of a document on the Web; its purpose is to express location only. A URI is a unique identifier for an entity; there is implicit binding between an entity and its metadata through a single identifier. In programming terms it may be regarded as similar to a "variable name" or a symbol. As such there is no obvious need to use the HTTP protocol, ie to name everything starting http://.... but it helps if you do. An RDF triple- or quad-store contains URIs for subjects and predicates; it may be queried purely as though it were an abstract object-database with no significance attached to the "names" of the subjects retrieved. However, when HTTP URIs are used as names for entities, they become real - they work - they can be dereferenced. You can publish RDF data on the web simply, precisely because it takes the form of URIs using the HTTP protocol. From an alternative perspective, the entire WWW becomes an abstract database free to be queried. It allows data published by different organizations to be federated, a process known as Linked Data. As a bonus, a web-server can be configured to perform content-negotiation based on what kind of a response a client requests; the same URL may return text/html (better, application/xhtml+xml) for a web-browser, but a representation in application/rdf+xml for an RDF browser requesting it. Coming full-circle, to ease the production of data for existing webmasters, RDF may be embedded in (X)HTML documents using either RDFa, GRDDL or eRDF markup; all these and custom microformats may be translated into RDF using an appropriate agent (such as OpenLink's Sponger, which can be seen in action at URIBurner). It is possible and desirable to define a mapping between relational and RDF-based databases. In the most obvious form, for a given table, each field becomes a predicate and each row an entity. Obviously this doesn't gain us much. However, you could further extend this to other well-known ontologies; for example, formulate a mapping from PHPBB's discussion forums to sioc:Forum entities, from posts within those forums to sioc:Post entities, etc; users can become entities of type sioc:User, with data filled-out using the FOAF ontology to express their properties (name, nickname, email address, homepage, etc). Then anyone using an RDF browser will experience the well-known sense of hierarchy that SIOC brings, that "this forum" contains "this thread" which contains "this comment" - because the SIOC ontology brings that nesting structure by defining what `/contains/' means. 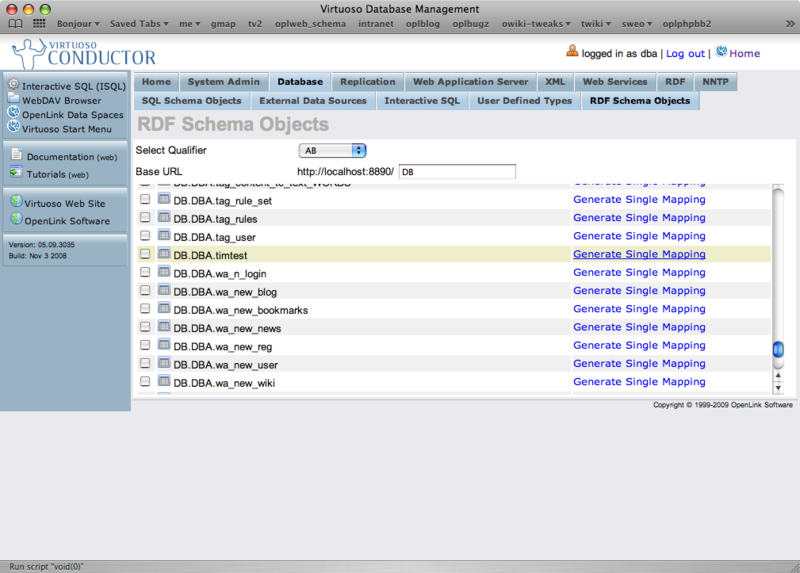 OpenLink Virtuoso has a system known as RDF Views, whereby this translation from relational to RDF data is made dynamic; the triples are not realised but rather calculated from the relational data on demand. This way you never have out-of-date data whilst waiting for another import or sync. You can write the scripts to implement these RDF Views by hand, but Virtuoso has automated the whole process, both in general with transforming relational data from tables to RDF, and specifically for the cases of PHPBB, Wordpress, MediaWiki? and Drupal. Virtuoso has a generalized mechanism for automatically generating a canned RDF view from a given table, available from the Conductor administrative interface. Naturally you can use the auto-generated RDF View script as a starting point for your own scripts, adding value through references to existing ontologies and using stored functions/procedures to manipulate the values into a suitable string form for use in the URIs. There is more information about this to be found in the documentation. 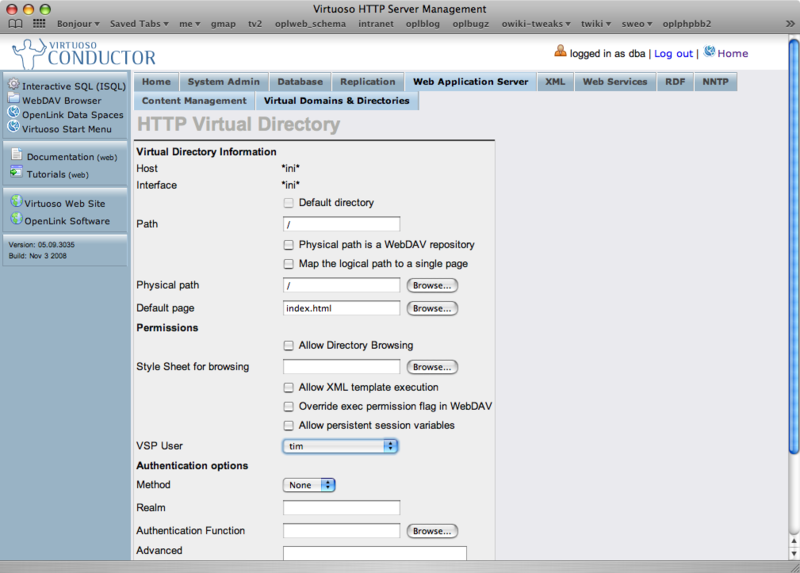 In this case we follow the process of creating RDF data from an empty Virtuoso instance, using PHPBB3 as an example. By default this will give you an instance listening on port 1111 for SQL / ODBC connections and port 8890 for HTTP. Point your browser at http://hostname:8890/conductor/ and log in to the conductor. Choose the System Admin tab and Packages there. Select a handful of ODS packages, such as Discussion, Framework and Wiki and definitely PHPBB3, iSPARQL and cartridges and press 'install'. Background: when new ODS (WebDAV) users are created, a trigger automatically adds them as PHPBB3 users. This is the preferred way to register PHPBB3 users. Point your browser at http://hostname:8890/ods/ and click sign-up. Account-creation is simply a case of filling in the form; you will be presented with a view of your account profile when complete. Point your browser to http://hostname:8890/phpBB3/ - this installation is the result of installing the VAD package earlier. Log in as the user you created above and peruse the default post etc. By extension, the system `dba' user has been made administrator of this phpBB instance. As an interface straight into the RDF data, point your browser at http://hostname:8890/phpBB3/user/someuserid . This will present you with an instance of the OpenLink RDF Browser, with http://hostname:8890/phpBB3/user/someuserid as the source URI from which to start browsing. Click around! Browse the data - check the SVG views and `raw triples' etc. Explore the links from statements about a given phpBB3 users to forums and articles posted by them. 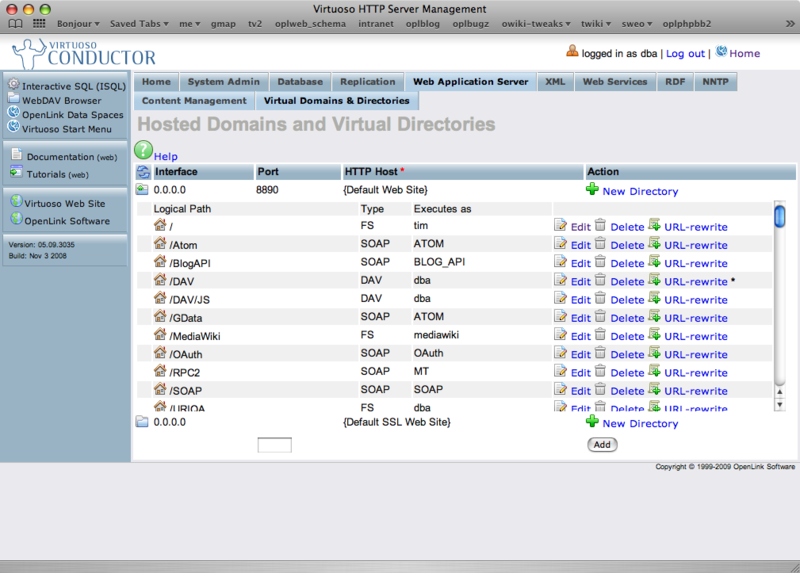 For background reading: see this video of PHP hosting on Windows Vista. Each of these examples shows how to get "my URI" out of these things and play with an RDF mapping straight away. 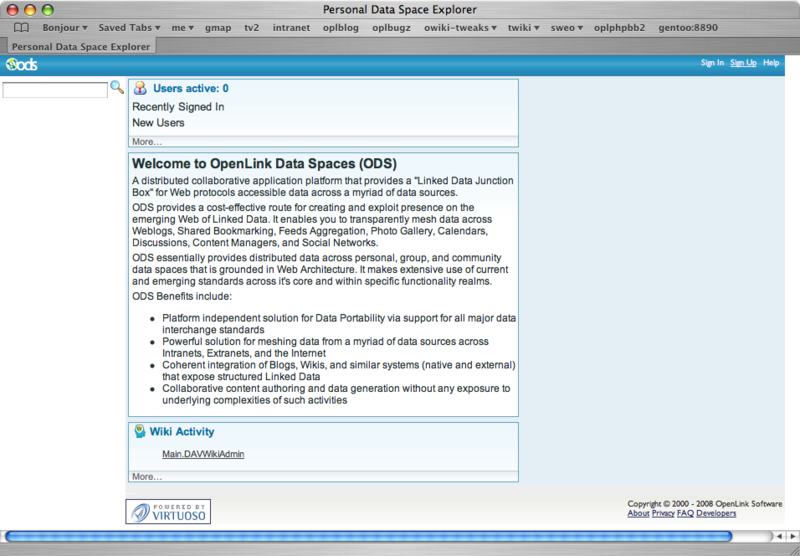 Additionally you can use a standalone RDF browser, such as the OpenLink Data Explorer, Tabulator or Disco to browse the data. Here we walk through the process of hosting PHP in Virtuoso, building from compiling sources to extensions, writing a simple web-application and viewing data. At this point it would be wise to double-check the top-level README.php5 file in the open-source distribution, as it may contain more up-to-date instructions. configure and build Virtuoso to reference the PHP you built. The ZTS and TSRM pthread options are particularly important; without them, Virtuoso will have serious threading incompatibilities. Note that many or most Linux distributions do not use these options, as they tend to package PHP for use as mod_php with the Apache web-server. You should pick and choose the options starting from the minimal requirements and whatever modules your application requires and/or are likely to be useful from the above. Note that many of these options require external libraries to build (eg openldap, bzip2, curl, libxml2, etc). Then proceed to use make and make install as usual. Once you have installed Virtuoso, you should copy the php5 hosting library, libphp5.so and extensions (*.so) into place in the /usr/local/virtuoso/lib/virtuoso/hosting/ directory; the php.ini file goes in the database directory, by default /usr/local/virtuoso/var/lib/virtuoso/db/ . Here we see the wiki markup parsers, an imagemagick plugin (for use in the ODS-Gallery application), and a link to the PHP library. 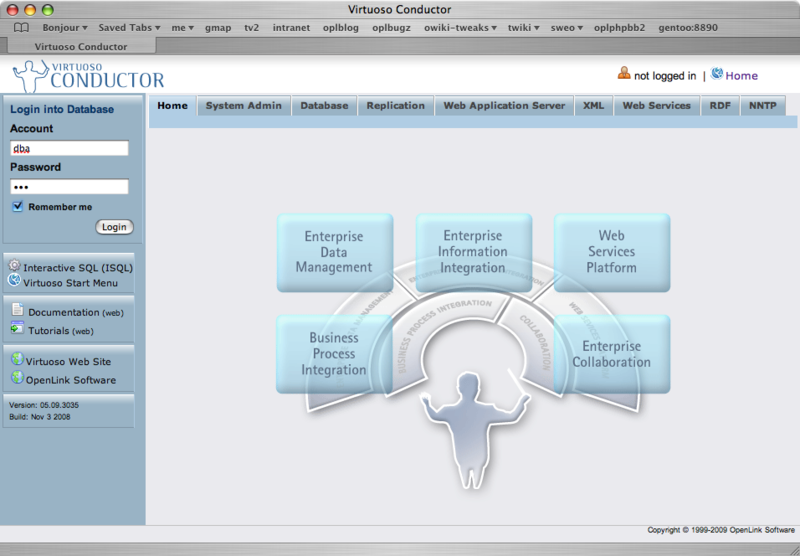 To host a PHP application within Virtuoso, it should suffice to enable the relevant lines (5 and 6) above. If you build your PHP as above, extra extensions can be added as required afterwards. As a worked example, we continue by compiling the Alternative PHP Cache (APC) PHP extension for ourselves. edit the php.ini file and search for `Extensions'. Add and remove lines there as required. *** Please fix the above issue(s) before trying again. Given that Virtuoso provides not just a webserver with PHP hosting ability, but the whole backend ODBC-compatible database environment as well all in one package, it makes sense to be able to connect back to the hosting RDBMS instance from within your PHP application/script. The `virtuoso.allow_dba' property controls whether the administrative dba user can be used as the username to connect to the ODBC data-source; by default, it cannot, as a security measure. log in as dba, and navigate to "web application server" and "Virtual Domains and Directories"
The function verifies that the Virtual Directory has been properly configured with a user valid for SQL logins and not disabled, else it logs a message and returns FALSE. Permissions Note: If you are deploying an application that runs as a specific user, permission must be granted for it to access tables. 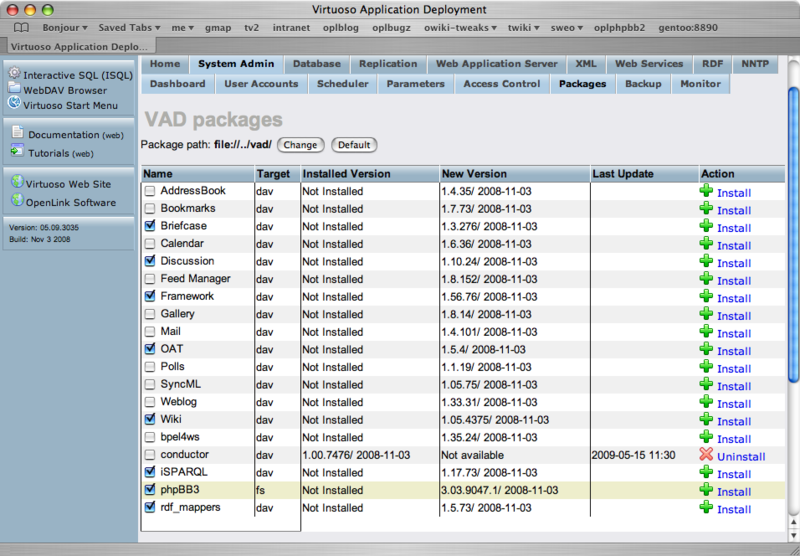 Additionally, for deploying an application package (eg as a VAD of your own), you can export the virtual-directory specification and have it create your endpoint, including specifying a user as which it should run, all executable as SQL/PL from within your package. Please re-read the previous section "putting it all together", above, and note the requirements for permissions to be granted on relevant tables to the user as which your PHP application will run.